As well as my other vehicles I have dug out some old buggies which I am aiming to finish off and use with the force. These are FlakBuggies or Ack Ack Buggies. These models are starting off from Ork Buggies. They use Flakwagon weapons (which I had used as Trukks in other conversions). Though the one on the end is using a Big Gunz instead. 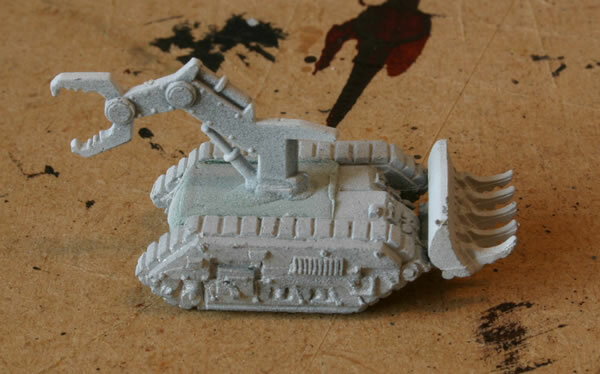 The boys from the epic40k.co.uk forums have come up with some cracking ideas for vehicles. Ork personnel transports to get the pilutz and crew out to the rokkit fightaz! Ork bulldozah (or would they call it a squigdozah?) for clearing all of the "akksidentz" off the runway. A luggage loader - to get the loot on and off (think airport suitcase baggage trains). A huge set of steps for the pilots, complete with a egotistical flyboy perched on the top. Unarmed Wartraks for towing planes on the ground. Here is a conversion of an Imperial Basilisk Hull (older model version) with a crane made from the claws of a plastic Ork Battlewagon. The hull was filled with green stuff and a dozer blade from Epic40k models was added to the front.